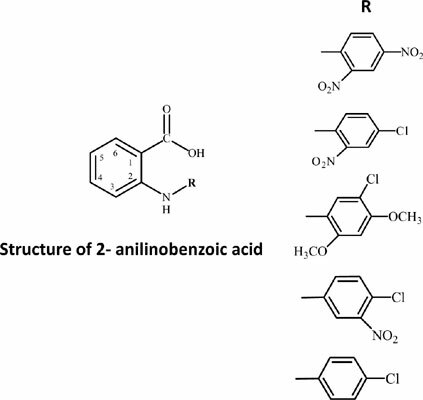 Background: Anthranilic acid derivatives are important pharmacophores in drug discovery. Several of them are currently being used, such as mefenamic acid and meclofenamates, possess analgesic, anti-inflammatory and antipyretic activities. Some anthranilic acid-based scaffolds have also been reported for the management of metabolic disorders. Objectives: The aim of the current study was to investigate the antiglycation potential of 2-anilino benzoic acid derivatives against (N-phenylanthranilic acid) fructose- human serum albumin (HSA) glycation. The study also analyzed the effects of newly identified antiglycation inhibitors on AGEs-mediated intracellular reactive oxygen species production, and associated impaired proliferation of the hepatocytes. Methods: The present study focuses on the antiglycation activity of 2- anilinobenzoic acid derivatives 1-18 in in-vitro human serum albumin (HSA)- fructose model. These derivatives were also identified as non-toxic to 3T3 mouse fibroblast cell-line using metabolic assay. The effect of the most promising derivative 1, 2- (2, 4- dinitroanilino)benzoic acid, was studied in a dose dependent manner, co-incubated with fructose-derived AGEs (0- 200 μg/mL), on rat hepatocytes proliferation and associated intracellular generation of ROS via MTT assay and DCFH-DA technique, respectively. Results: We found that derivative 1 ameliorates the elevated intracellular oxidative stress and associated diminished proliferation of the hepatocytes in response to AGEs. Conclusion: In conclusion, we identify novel 2- anilino benzoic acid derivatives as antiglycation agents through in-vitro and cellular-based models. 2-Anilinobenzoic acid derivatives, protein glycation, advanced glycation end products, hepatocytes, oxidative stress, antiglycation agents.